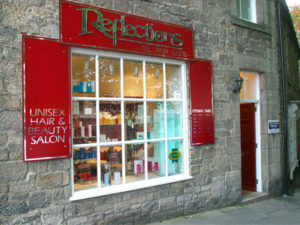 Reflections has been at the heart of Corbridge for over 20 years. The warm, friendly salon offers an array of treatments for all aspects of hair and beauty. Highly knowledgeable and dedicated hairdressers and therapists are on hand to advise, whether you’re there for a quick haircut or a relaxing full colour and beauty experience. Awarded five stars by ‘The Good Salon Guide’ and Wella ‘Master Colour Experts’ you’ll be in excellent hands. The team at Reflections use only the best professional products, from L’Oreal, Paul Mitchell, GHD and Clarins. A prestigious Clarins Gold Salon, you can be sure that you will receive the highest standards of service and treatment at Reflections.